Be the first to share your favorite memory, photo or story of Louvina. This memorial page is dedicated for family, friends and future generations to celebrate the life of their loved one. Mrs. Louvina Judd Geralds of Columbia, Kentucky, formerly of Greensburg, Kentucky, daughter of the late Frank Hollins and Nellie Dial Hollins, was born on Sunday, September 16, 1928 in Taylor County and departed this life on Tuesday, August 14, 2018. She was 89 years, 10 months, and 29 days of age. 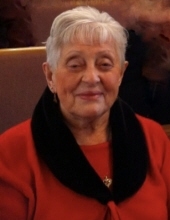 She had made a profession of faith in Christ and was a member of the Bradfordsville Baptist Church. She was also a retired Nursing Assistant for Jane Todd Crawford Hospital. She united in marriage to Garland T. Judd on June 2, 1945 who preceded her in death on November 2, 1977. She later united in marriage to Ernie Geralds who also preceded her in death in March of 1998. Survivors include four sons and three daughters-in-law: Tommy Judd of Greensburg, Morris Judd, Ray and Teresa Judd all of Campbellsville, Robert and Nora Judd of Monticello, and Anita Judd Schnitzius of Greensburg; two daughters and sons-in-law: Rosa and Bill Vittitoe of Columbia, and Kathy and Donnie McCubbin of Elizabethtown; 12 grandchildren; a host of great-grandchildren; and other relatives and friends. Mrs. Geralds was also preceded in death by a son: Arnie Judd on February 15, 2006; three brothers: Raymond Hollins, Garland Hollins, and Gilbert Hollins; and her canine companion: Cody. The funeral services for Mrs. Louvina Judd Geralds will be conducted at 10:00 A.M., Central Time, Friday, August 17, 2018 at the Cowherd and Parrott Funeral Home with burial to follow in the Greensburg Cemetery. Bro. John Simpson officiating. Memorials are suggested to Hosparus of Green River or Gideon Bible Fund, which can be made at the funeral home. To plant a tree in memory of Louvina Judd Geralds, please visit our Tribute Store. "Email Address" would like to share the life celebration of Louvina Judd Geralds. Click on the "link" to go to share a favorite memory or leave a condolence message for the family.